SUMMARY: We present 4 cases of carcinoma ex pleomorphic adenoma of the parotid gland. In 3 of the 4 cases, diffusion-weighted and apparent diffusion coefficient (ADC) mapping images clearly revealed carcinoma as a hypercellular area with low ADC values and pleomorphic adenoma as a hypocellular area with high ADC values. Diffusion-weighted images demonstrated well complex tissue components in carcinoma ex pleomorphic adenoma, which may be useful for the diagnosis of this disease. Pleomorphic adenoma is a common neoplasm that arises from the major salivary glands and infrequently undergoes malignant transformation. Malignant changes in pleomorphic adenoma have been associated with a long duration, tumor recurrence, radiation therapy, an advanced age, and tumor size. Because the incidence of malignancy is correlated with the duration of pleomorphic adenoma, the risk of developing malignancy is only about 1.5% for a duration of <5 years but increases to 9.5% for a duration of >15 years.1 Carcinoma ex pleomorphic adenoma is an infrequent aggressive malignancy that is believed to evolve from a pre-existing benign adenoma. It accounts for 3.6% (range, 0.9%–14%) of all salivary neoplasms and for 11.7% (range, 2.8%–42.4%) of salivary malignancies.2 Meanwhile, the imaging findings of carcinoma ex pleomorphic adenoma are often nonspecific and are not precisely differentiated from those of other benign and malignant salivary gland tumors. Here, we describe the imaging findings of 4 patients with carcinoma ex pleomorphic adenoma of the parotid gland and correlate these with pathologic findings. Furthermore, we discuss MR imaging diagnostic clues in carcinoma ex pleomorphic adenoma of the parotid gland. MR imaging was performed by using a 1.5T MR imaging system (Intera Achieva 1.5T. Pulsar; Philips Medical Systems, Best, the Netherlands) with parallel imaging capability (referred to as sensitivity encoding). Axial diffusion-weighted (5000–5100/70–72 [TR/TE], 256 × 256 matrix) images were obtained by using a single-shot spin-echo echo-planar imaging sequence with a section thickness of 4 mm, without an intersection gap, in all patients. The sequence was executed with 2 values of motion-probing gradients (b = 0 and 1000 s/mm2). A 48-year-old woman felt a slowly enlarging right parotid gland for 5 years. The parotid mass was painless without facial nerve paralysis. T2-weighted images exhibited the 35 × 25 mm mass in a well-demarcated area of heterogeneous intensity (Fig 1A). The lateral component showed mild high intensity; the intermediate component, low intensity; and the medial component, extremely high intensity on T2-weighted images. Diffusion-weighted and apparent diffusion coefficient (ADC) mapping images revealed the lateral component as hypercellular and the intermediate and medial components as hypocellular (Fig 1B). A histopathologic examination of the surgical specimen documented pleomorphic adenoma and an epithelial malignancy, like myoepithelial carcinoma. The lateral component was documented as carcinoma; the intermediate component, as pleomorphic adenoma with marked fibrosis; and the medial component, as pleomorphic adenoma with a marked chondroid matrix. A 48-year-old woman with a carcinoma ex pleomorphic adenoma (case 1). A, Axial T2-weighted image (fast spin-echo: TR/TE, 4102/90) shows a well-demarcated mass with heterogeneous intensity of the right parotid gland. The lateral component shows mild high intensity (arrow), the intermediate component shows low intensity (arrowhead), and the medial component shows extremely high intensity (curved arrow). B, ADC mapping image shows the lateral component of hypercellularity with carcinoma (arrow) and the intermediate and medial component of hypocellularity with pleomorphic adenoma (curved arrow). A 76-year-old man had a painless mass in the right parotid gland for 50 years and had undergone surgical resection twice. The residual tumor had grown rapidly during the prior 6 months. The recurrent tumor was painless with facial nerve paralysis. T2-weighted images exhibited the 52 × 47 mm mass as a well-demarcated area of heterogeneous intensity (Fig 2A). The anterior component showed mild high intensity, and the margins of the posterior component showed low intensity on T2-weighted images. Diffusion-weighted and ADC mapping images revealed the anterior component as hypercellular and the posterior component as hypocellular (Fig 2B). The posterior component showed punctuate calcifications on CT. A histopathologic examination of the surgical specimen revealed pleomorphic adenoma and an epithelial malignancy, such as adenosquamous carcinoma or mucoepidermoid carcinoma. The posterior component was documented as pleomorphic adenoma with fibrosis, hyaline degeneration, and calcification; and the anterior component, as carcinoma with infiltration beyond the capsule. A 76-year-old man with a carcinoma ex pleomorphic adenoma (case 2). A, Axial T2-weighted image (fast spin-echo: TR/TE, 4102/90) shows a mainly well-demarcated mass with heterogeneous intensity of the right parotid gland. The anterior component shows mild high intensity (arrowheads), and the margin of the posterior component shows low intensity (arrow). B, ADC mapping image shows the anterior component of hypercellularity with carcinoma (arrowheads) and the posterior component of hypocellularity with pleomorphic adenoma (arrow). An 80-year-old man presented with a painless mass in the right parotid gland of 30 years' duration. However, the mass had shown sudden rapid growth during the prior 3 months and had become painful, with facial nerve paralysis. T2-weighted images exhibited the 35 × 33 mm mass as a well-demarcated area of heterogeneous intensity. The anterior component showed low intensity; and the posterior component, mild-to-moderate high intensity on T2-weighted images. Diffusion-weighted and ADC mapping images revealed the anterior component as hypocellular and the posterior component as hypercellular. The anterior component showed scattered calcifications on CT. A histopathologic examination of the surgical specimen revealed pleomorphic adenoma and an epithelial malignancy (eg, adenocarcinoma, squamous cell carcinoma, or mucoepidermoid carcinoma). The anterior component was documented as pleomorphic adenoma with fibrosis and calcification; and the posterior component, as carcinoma with infiltration beyond the capsule. A 70-year-old woman presented with a painless mass in the left parotid gland of 5 years' duration. Facial nerve paralysis had been felt for 6 months and had gradually progressed. T2-weighted images exhibited the 38 × 20 mm mass as a well-demarcated area of heterogeneous intensity. T2-weighted images showed fairly mixed signal intensity. Hypercellular and hypocellular areas coexisted in a complicated manner on diffusion-weighted and ADC mapping images, and internal hemorrhage was revealed on T1-weighted images. The mass showed necrosis and punctuate calcifications on contrast-enhanced CT. A histopathologic examination of the surgical specimen revealed pleomorphic adenoma and epithelial malignancy with adenocarcinoma. The pleomorphic adenoma portion contained calcifications; and the adenocarcinoma portion, severe hemorrhage and necrosis. According to the World Health Organization histologic classification published in 2005, malignant derivatives of pleomorphic adenomas of salivary gland origin, so called “malignant mixed tumors,” should be divided into 3 different clinical and histologic entities: 1) carcinoma ex pleomorphic adenoma (carcinoma in pre-existing pleomorphic adenoma), 2) carcinosarcoma (true malignant mixed tumor), and 3) metastasizing pleomorphic adenoma. Most malignant mixed tumors are carcinoma ex pleomorphic adenoma, whereas the latter 2 types are extremely unusual. The typical clinical presentation in a patient with carcinoma ex pleomorphic adenoma is a longstanding history (average, 10–15 years) of pleomorphic adenoma and a sudden period of rapid growth (average, 3–6 months). Pain and facial nerve paralysis are often present. Carcinoma ex pleomorphic adenoma usually is a more poorly circumscribed mass than benign pleomorphic adenoma; is most likely to occur within the major salivary glands, especially the parotid gland; and typically occurs in patients in the sixth-to-eighth decades of life. 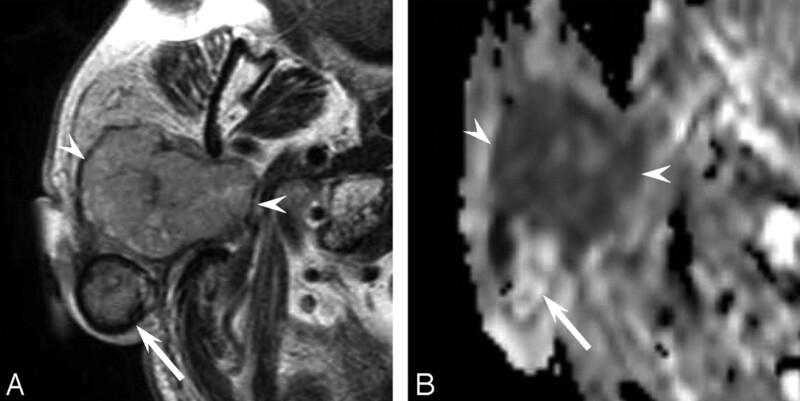 Salivary gland tumors have been reported to have the following MR imaging findings3–4: an irregular tumor margin, signal-intensity heterogeneity, tumor infiltration into surrounding tissue, and low signal intensity on T2-weighted images. On the other hand, pleomorphic adenomas often show heterogeneous low-to-intermediate signal intensity on T1-weighted images and intermediate-to-high signal intensity on T2-weighted images. Because pleomorphic adenomas show a variety of signal intensities, which reflect their cytomorphologic and architectural variabilities, it is often difficult to distinguish pleomorphic adenomas from low-grade malignant tumors in the absence of an irregular margin or infiltration into the surrounding tissue. Preoperative radiologic diagnosis by conventional MR imaging of carcinoma ex pleomorphic adenoma containing complicated tissue components remains a challenge for radiologists. Preoperatively, we have diagnosed malignant salivary gland tumor in case 4 by conventional MR imaging without diffusion-weighted images because hemorrhage and necrosis were evident. Meanwhile, in the other cases, hemorrhage, necrosis, irregular margins, or infiltration into surrounding tissue beyond the fibrous capsule were not obvious, and the differentiation of benignity and malignancy was difficult by conventional MR imaging alone. A previous article reported that the ADC values of pleomorphic adenoma are generally higher than those of malignant salivary gland tumors.5 In 3 of the described cases (other than case 4), malignancy was suggested on the basis of the findings of diffusion-weighted and ADC mapping images (ie, carcinomas were visualized as hypercellular areas with low ADC values; and pleomorphic adenomas, as hypocellular areas with high ADC values). However, because necrosis in carcinomas is visualized as hypocellularity with high ADC values, comparative evaluations by using contrast-enhanced CT may be necessary. In conclusion, the MR imaging findings of carcinoma ex pleomorphic adenoma are not specific because of the coexistence of different tissue types. Nevertheless, diffusion-weighted images enable tissue characterization at the microscopic level by revealing the various tissue components in carcinoma ex pleomorphic adenoma, which allows the differentiation of benign and malignant salivary tumors. Thus, we recommend including diffusion-weighted and ADC mapping imaging in MR imaging protocols of the salivary gland to facilitate the differentiation of salivary gland tumors. Accepted after revision December 7, 2007.